Home > Health > DNA > MyHeritage DNA Reviews: How Does This At Home Test Measure Up? Caution: You might want to steer clear of a DNA test unless you want to give your spouse proof that you are indeed a Neanderthal. But seriously, you can discover Neanderthal genes and much more with an at-home DNA test. Check out our MyHeritage DNA reviews to see if this is the test for you. How Do At Home DNA Tests Work? How Much Does It Cost And When Can I Expect Results? Looking For DNA Ancestry Testing? Simply swab your cheek and place the swab in the provided tube. Use the pre-labeled envelope included in the kit to mail your sample to the MyHeritage DNA lab for analysis. View your results online in 4 weeks. How Do Consumers Weigh In On MyHeritage DNA? 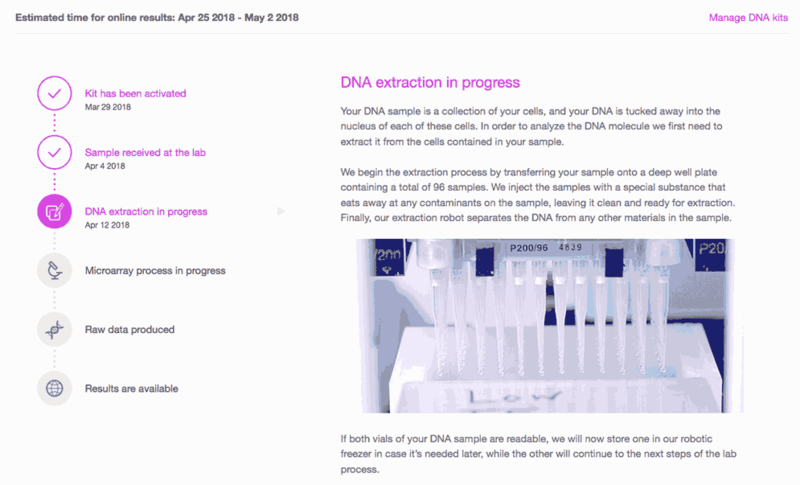 Here’s some of the customer feedback on MyHeritage DNA that we’ve found from around the web. One of our staff ordered a copy of MyHeritage DNA so we could share our personal experience with you. The box arrived in 2 days since we have Amazon Prime and looks quite snazzy! Check out our unboxing video below for the scoop. After opening the box, the rest of the DNA gathering process was fairly smooth. You basically take a long cotton swab, swab the inside of your cheek with it, and then place it into a vial. The only thing I hesitated with is they ask you to insert the swab into the container and break the swab at a line drawn on the swab – I was worried the swab would break at the wrong place or the container wouldn’t close. Fortunately that worked seamlessly as well and in hindsight seemed fairly foolproof. The only thing that really irritated me about the whole process was the shipping. The postage was not included, and although it says “place stamp here,” I weighed and calculated my envelope with the sample once it was ready to ship on the USPS website, and it said it would take $0.71 cents to mail, which is two stamps – I can see people only adding one and the sample getting returned. Wouldn’t take much for them to prepay the postage in my opinion. Lastly, regarding the companies privacy and data retention policy – this is interesting – they’re based in Israel. At first I thought that was a concern, but after thinking about it that’s probably safer than having it in the U.S., given the track record of some companies mining and cross-referencing consumer data. But if this is a concern for you, you can review the MyHeritage DNA terms and conditions, as well as their consent agreement. After all, this is your DNA we’re talking about here, and you may have noticed that DNA cases have been in the news lately. My results arrived on April 21, which is 4 days before their ETA. When you first launch the link in the email, you’ll see an impressive video with bells and whistles and a spinning globe that will reveal your ethnicity estimate as it zooms in and colors sections of the globe corresponding to your DNA. Here’s a screenshot of my results. You also have the option of viewing all available ethnicities (a long list, in other words all the ethnicities for which your DNA came up 0%). See the key differences between MyHeritage DNA and other DNA test providers. 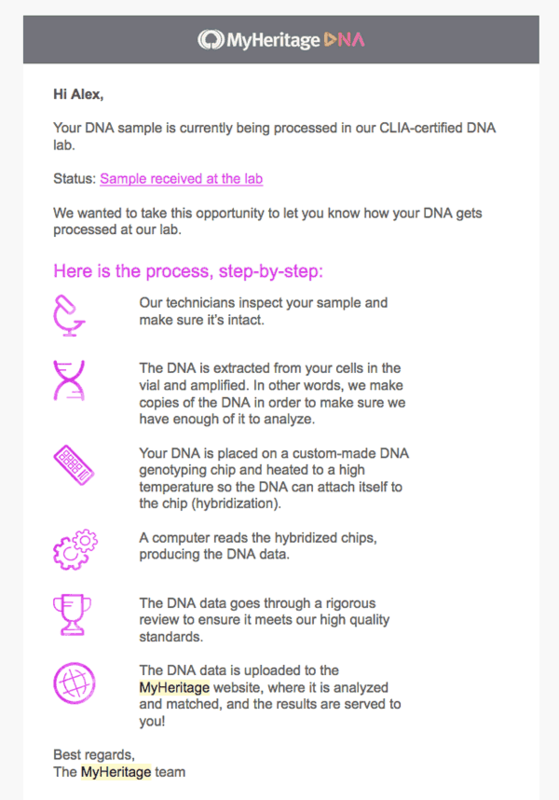 23andMe offers health-related DNA results, while MyHeritage does not. The MyHeritageDNA test kit is significantly less expensive than 23andMe’s tests. 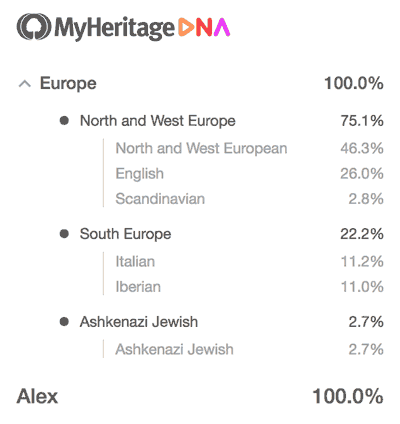 MyHeritage has a highly active online community; 23andMe does not. You can upload your raw DNA results from AncestryDNA, 23andMe and FamilyTree DNA to MyHeritage’s database. AncestryDNA doesn’t allow you to upload other companies’ results. Ancestry.com’s DNA database is much larger than MyHeritage. FamilyTree DNA (FTNDA) offers three separate types of DNA ancestry tests (autosomal, mtDNA and Y-DNA), but MyHeritageDNA only sells an autosomal DNA ancestry test. MyHeritage’s database of genealogical records, family trees and other research tools is much larger than that of FTNDA. MyHeritage DNA will give you a percentage breakdown of your ethnicity from 40+ regions around the world. Check out this video to see how you’ll view your results online. What’s The Best DNA Test For Ancestry? Want to learn more about DNA testing? 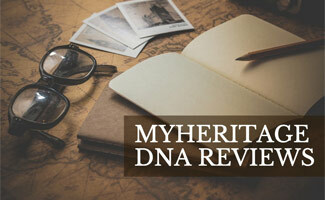 Not sure after reading our MyHeritage DNA test review? Check out our DNA ancestry test reviews, which give you all the info you need to know about how DNA tests work, what the results mean, how to interpret them, and more. We compare the top 6 companies in the DNA testing space, so head on over and see how MyHeritage DNA stacks up against the competition. What are you hoping to learn from an at-home DNA test?